In MosaicArt Epic from Florida Tile, geometry meets stunning and elegant beauty in stylish mosaics. Available in a variety of shapes from mini brick, to sophisticated geometrics and inspiring arabesques, this latest collection of glazed porcelain floor and wall tile offers a wealth of design possibilities and easy installation with dimensional, interlocking, sheet mounted mosaics. Whether your dream is to create a spa-like luxury retreat, add an elegant backsplash, or to express yourself boldly with dramatic black and white combinations, MosaicArt Epic’s 11 shapes and 6 designer colors can bring your vision to life. 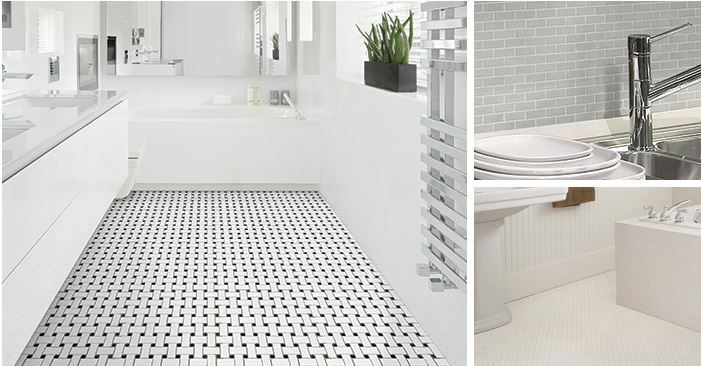 When used for a complete wall or floor design or as an insert pattern, these mosaics will help you create an intriguing and unique space that will stand the test of time. MosaicArt Epic porcelain floor and wall mosaic tile is appropriate for all residential and commercial wall, countertop, and backsplash applications and all residential floor applications and is GREENGUARD® certified for indoor air quality.